Sputnik: What has been the effect of Brexit on the UK's economy? Have you got any specific numbers you can share with us? How was it affected and has the country benefited or lost economically from what this absolute malaise that has been going on? What are your specific thoughts? Geraint Johnes: We know that Brexit obviously hasn't happened yet and so a lot of the impact is still to come. But there is work that has been done by the Bank of England that suggests that there has been quite a severe hit on GDP growth as a consequence of the vote in 2016 and really, as a consequence of the subsequent uncertainty. It is the uncertainty that has really caused the damage so far and that has been reflected in a very muted level of business investment. And that low level of business investment we have had has fed through into low GDP figures and it also bodes ill for the long term future because clearly productivity is related to investment. If you haven't got good machinery to work with then you can't work productively. And productivity, as we know, has long been a problem for the UK economy. This is doing nothing to help. Sputnik: That is very interesting you mentioning this. From speaking to various experts and professors, they are saying obviously there has been this long line of companies storing lots of products, goods, services in warehousing. You can't get warehousing in the UK for love of money at the moment. So you have got that situation, you have got this situation where you are saying there isn't any investment coming into the country or people don't want to invest, that is understandable. But there is a sort of paradox in many ways that the country still achieved great economic growth than the likes of Germany, for example, in the last sort of 18 months. How can that be then? Geraint Johnes: No, it is not true that the UK has had great economic growth. And there is some indicators sort of being very favourable. So, if you look at the labour market, for example, we have had continued increases in the level of employment — employment has risen to record levels. But this is being accompanied by a slowdown in the rate of economic growth. So, while we would have expected growth to have continued at around 2 per cent — between 2 and 2.5 per cent — over this recent period growth has been very subdued. And the economic forecasts, indeed the government came out with at the time of the spring statement last week, suggested that over the next five years we are not going to achieve as much as 2 per cent GDP growth in any one of those years. So, there has been a clear hit on economic output and the UK has gone from top of the G7 in terms of economic growth to a very much worse position over the period since the referendum. Sputnik: And do you share the view that Britain has plunged into deep political crisis? And what are the chances that a crisis growing into an economic or a financial one? I mean from all the people I am talking to in the UK when I speak to various people there is a deep unrest and unhappiness about the whole process of this in terms of the 17.4 million voting to Brexit and it not being delivered. And we're being dealt with this intransigence of this political will from the members of Parliament and the people who are just so out of touch with the electorate, especially in the north of the country. That is the general theme that's sort of washing through the UK at the moment. Would you be able to add to that? Geraint Johnes: A lot is said about the 17 million that voted for Brexit, not so much is said about the 16 million that voted against it. The fact is that the outcome of the referendum was close, the "leave" campaign won. And that means that the government has committed itself to delivering a Brexit but the government has also wanted to recognise the fact that the country is split on this issue. If we look at the way forward now, clearly there is something of a political crisis but there are routes forward that we can see: the time is short and that is intended to narrow the options. 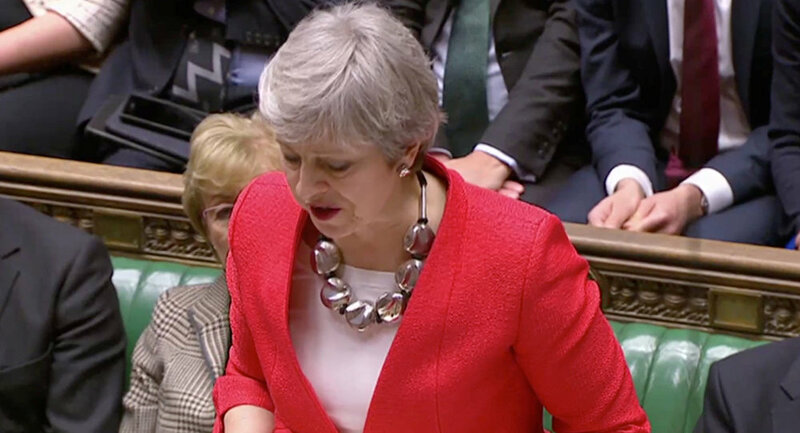 And the two main options that remain available are for Parliament to pass the withdrawal agreement and political declaration — what is being called "meaningful vote three" — next week, in which case the UK would wish to see this short extension in order to get the legislative programme through that is needed in order to deliver on Mrs May's deal. Another possibility is that we exit the European Union with no deal and that would happen next Friday if that happens. And the likelihood of one or the other of those two outcomes has clearly increased as the time has run down. There are two other possible outcomes. One is to revoke Article 50. That doesn't seem likely, although it is something that people are starting to talk about more now that the UK should, for the time being, stay within the European Union and then see what the disposition is somewhere further down the road. The other possibility is to try and find another deal and that may well involve a longer extension. To do that there would need to be amendments to "meaningful vote three" or backbenchers would need to instigate the Standing Order No. 24 process in order to get an emergency debate. And that would involve Parliament in taking control of the process: a series of indicative votes seeing which way Parliament wants to go with this. It is important in that context to recognise that what Parliament is being asked to approve is made up of the withdrawal agreement to the legal document and a political declaration. And many people in Parliament object to the political declaration because that shows which way Mrs May wants to go but it doesn't leave open the possibility of any other solution such as a free trade agreement or a customs union or a single market customs union — ‘Norway style' — arrangement. And it would be possible to change the political declaration quite quickly without having to change the withdrawal agreement at all. The thing that is really important to get through at the moment is the withdrawal agreement. Tweaks can be made to the political declaration. So it would be possible even in the next week to get those tweaks.